John .H. Andrews, Plantation Acres: an historical study of the Irish land surveyor and his techniques (Ulster Historical Foundation, 1985). John H. Andrews, Shapes of Ireland: Maps and their makers, 1564-1839 (Dublin, 1997), pp. 118-152. Toby Barnard, Cromwellian Ireland: English government and reform in Ireland, 1649-1660 (Oxford, 2000 edn). Karl S. Bottigheimer, English Money and Irish Land: The Adventurers in the Cromwellian Settlement of Ireland (Oxford, 1971). D. Buisseret (ed. ), Monarchs, ministers and maps: The emergence of cartography as a tool of government in early modern Europe (Chicago, 1992). Aidan Clarke, Prelude to Restoration in Ireland: The end of the Commonwealth, 1659-1660 (Cambridge, 1999). John Cunningham, Conquest and land in Ireland: the transplantation to Connacht, 1649-1680 (Woodbridge, 2011). P.J. Corish,‘The Cromwellian regime, 1650-1660’, in T.W. Moody, F.X. Martin and F.J. Byrne (eds), A new history of Ireland, vol.3, Early modern Ireland, 1534-1691 (Oxford, 1991), pp. 353-86. R. Dunlop, ‘Sixteenth Century Maps of Ireland’, English Historical Review, 20 (1905), pp. 309-37. William H. Hardinge, ‘On manuscript mapped Townland Surveys in Ireland of a public character’, Royal Irish Academy Transactions, 24, (1858-71), pp. 3-119. 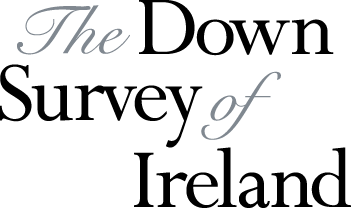 Thomas Larcom, The History of the Survey of Ireland commonly called the Down Survey (Irish Archaeological Society, 1851). Annaleigh Margey, ‘Representing plantation landscapes: The mapping of Ulster, c.1560-1640’, in James Lyttleton and Colin Rynne (eds. ), Plantation Ireland: Settlement and material culture, c.1550-1700 (Dublin, 2009), pp. 140-164. S. O’Domhnaill, ‘The Maps of the Down Survey’, Historical Studies, 3 (1942-43), pp. 381-92. Micheál Ó Siochrú, God’s Executioner: Oliver Cromwell and the conquest of Ireland (London, 2009). Jane Ohlmeyer, ‘A Laboratory for Empire? Early Modern Ireland and English Imperialism’, in Kevin Kenny (ed. ), Ireland and the British Empire (Oxford, 2004), pp. 26-60. J.P. Prendergast, The Cromwellian settlement of Ireland (London, 1996 edn). Jacinta Prunty, Maps and Map-Making in Local History (Dublin, 2004). William J. Smyth, Map-making, Landscapes and Memory: A Geography of Colonial and Early Modern Ireland, c.1530-1750 (Cork, 2006), pp. 166-97. James Scott Wheeler, Cromwell in Ireland (Dublin, 1999).